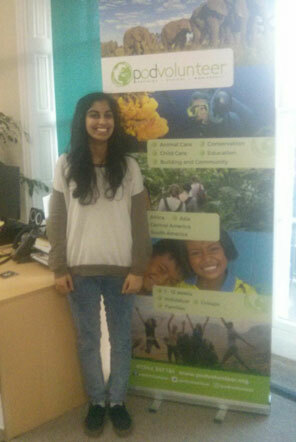 During February we were delighted to welcome Noama to our Cheltenham office for her work experience placement. We caught up with Noama at the end of the week to ask a few questions about herself and how she found her week with the Pod Volunteer team. Why did you choose to do your work experience at Pod Volunteer? I wasn’t sure what job I wanted in the future, only that I wanted to make a difference sustainably and ethically as well as travel…so when I saw Pod Volunteer ticked all those boxes I thought it would be a great place to start and learn more. I’d like to see myself working for a charity or non-profit organisation like Pod Volunteer – preferably overseas but the most important thing would be that I’m contributing on making a positive impact on the planet and on people. I’d like to visit a completely different culture – probably Latin America, or Thailand. Which of the Pod Volunteer projects would you like to join and why? Probably the Marine Conservation in Thailand or a child care project as you can immerse yourself in a completely different world or culture. 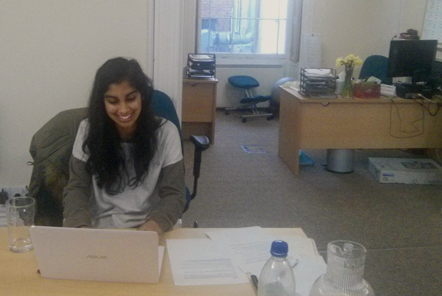 What did you enjoy most about your work experience at Pod Volunteer? I enjoyed working for Pod as it was a very relaxed and friendly environment to work in and doing research on something that I’m interested in made it much easier to do. 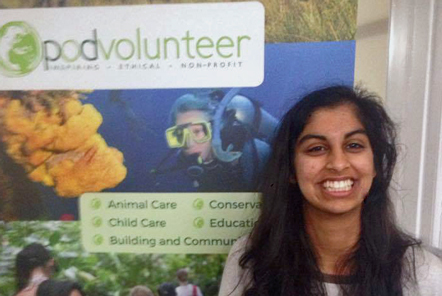 What did you learn about volunteering overseas while doing your work experience? I’ve learnt a lot about the whole process of volunteering overseas – the amount of management involved, what it’s actually like and how, with Pod, you’re given lots of support if you’re unsure about anything throughout. Also that it’s both hard work, rewarding and you see amazing things you can’t see at home, like swimming with marine life or feeding a cheetah. I had not realised the amount of effort that goes into reviewing things like the company website and statistics, as well as promoting the company through market research and social media in order to spread their message and get more people involved in Pod Volunteer. What advice would you give to a volunteer considering volunteering through Pod Volunteer? I would say if you have the funds and the enthusiasm then go for it! It seems like they’re unforgettable experiences and the people at Pod are very friendly and knowledgeable about the projects as they’ve all done projects abroad themselves. Finally, do you have any tips for students starting their work experience placements? Ask the people at work lots of questions and how they got to where they did – you can learn a lot from other peoples’ experiences. We really enjoyed having Noama as part of the team as we would like to send a big thank you to Noama for all her hard work and we wish her the best of luck in her future plans!